Gluing engineered hardwood floors to concrete represents a large portion of hardwood installations in Florida. Why? Most of our construction is concrete slab which in many cases eliminates traditional 3/4" hardwoods unless a plywood subfloor is attached to the concrete itself. The most common concern of many that plan on choosing the glue down method is the adhesives used. In the earlier days of engineered installations potent and toxic smelling glues were used until they were banned in the late 90's. Today more friendlier urethane adhesives are the norm such as Bostiks Best Urethane. • Recommended by Most Hardwood Manufacturers. Proper adhesives used for glue down hardwoods don't come cheap. Properly installed, a good round number to use in cost runs about .75 per square foot in glue alone using Bostiks urethane adhesive. Don't let the handyman convince you he can save money by buying a cheaper priced glue down at Home Depot. 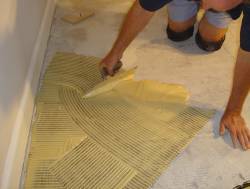 There are adhesives for all types of floor coverings. 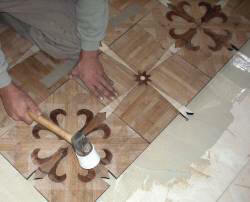 What may work for a vinyl floor as an example, will not work for a hardwood floor. The high percentage of installation failures with glue down hardwood floors in Florida proves that.